Just when you thought you've seen it all! If you haven't already noticed, we've launched a new feature called - 'Agent Portfolio Websites'. It is free - and it is yet another industry first by the Entegral team! Your Agent portfolio website is like your own personal real estate website which is usefull if you don't already have one of Entegral's template or custom build websites. It features your profile (photo, logo, contact details and description), a contact form, featured property listings and links to all your listings per suburb and status. 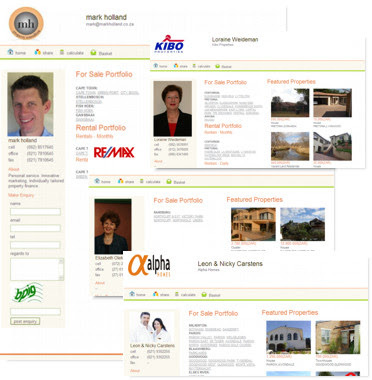 How to access it: Open one of your property listings on www.myproperty.co.za, you will notice a new 'visit my portfolio website' next to your photo. Click on it, this opens up your portfolio website. It is a unique address you can use to give to clients or include in your email signature. It is unbranded and when visitors search listings here, it only filters for your own listings! Link your domain! For only R300/year we will register a co.za domain for you, renew it on a yearly basis and link it to your portfolio website. E.g. if you register www.markholland.co.za we will link it to your profile site, when someone enters this address it opens up your portfolio site. Add one of our cost effective email packages and you can have your own personal site, with unique domain name and email for under R100/month! (exluding OMS subscription). If you'd like to register and link your own custom domain name to your profile please email the Entegral Helpdesk for info. Sorry, another error! Please don't show Final Sale properties on this site - they have been sold and are not available anymore! This is a great feature, thanks very much. I hope agents USE it! I'm concerned that information on www.myproperty.co.za is not being sucessfully updated from our website www.remaxoaktree.co.za and this creates a bad impression amongst consumers. Any suggestions?